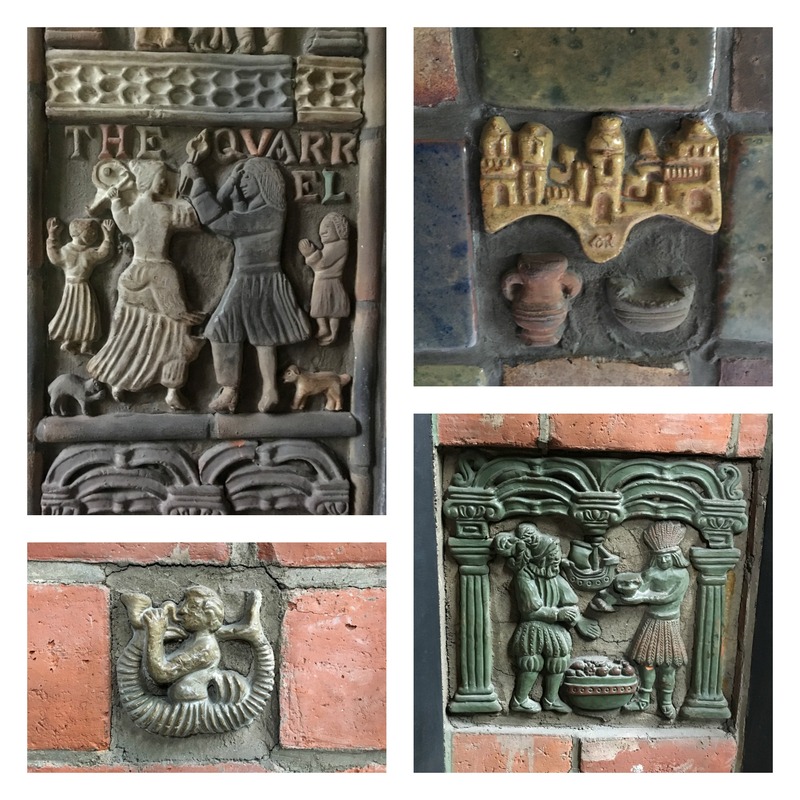 Last Friday I shared with you the unique historical gem that is the Moravian Pottery and Tile works. Today – I wanted to showcase some of the tile artists who I had the good fortune to exhibit with at the annual show. A long time fan – I was thrilled to see these beauties in person! Sculptural work exploring Flora and Fauna”. I have been a huge fan of her work on Instagram and was delighted to meet and chat with her in person. Her mythic/folklore references, her choice in animals, her respect/acknowledgement of the Art and Crafts style in her work… you can see why this all resonates with me. Her images themselves are so lively, and her use of line! She glazes her porcelain pieces with her own glaze recipes – the translucency accentuating the carved lines : masterful! I could go on all day. Brian and Katie were neighbors in my tent! Heavens. Their precise design/line work! Their delicious glazes! And as a person of Celtic descent as well, it spoke to me on many levels. 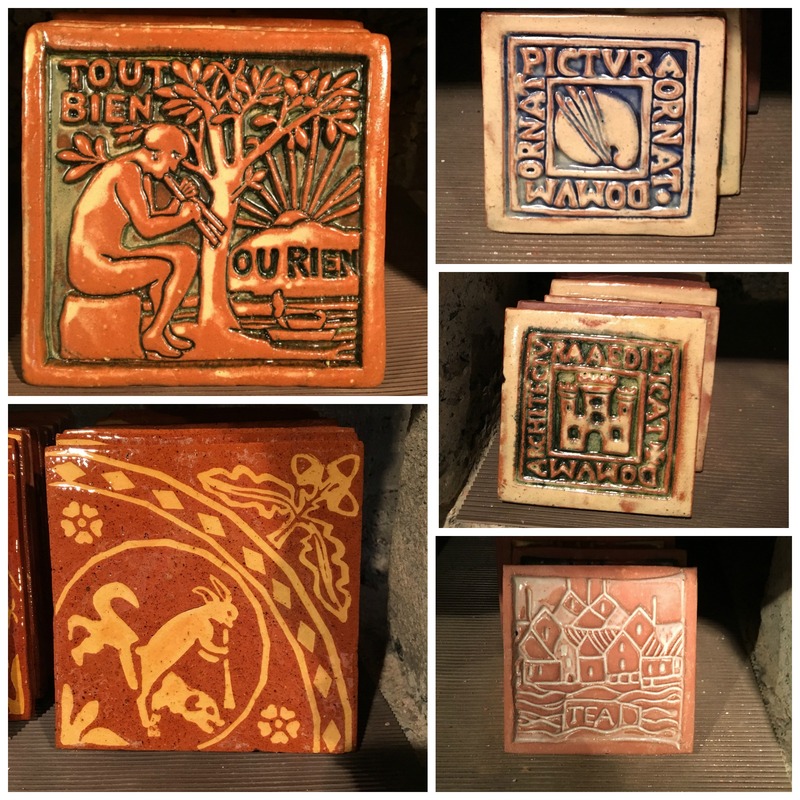 (Their stoneware tiles are fired to ^5 for you clay people out there.) 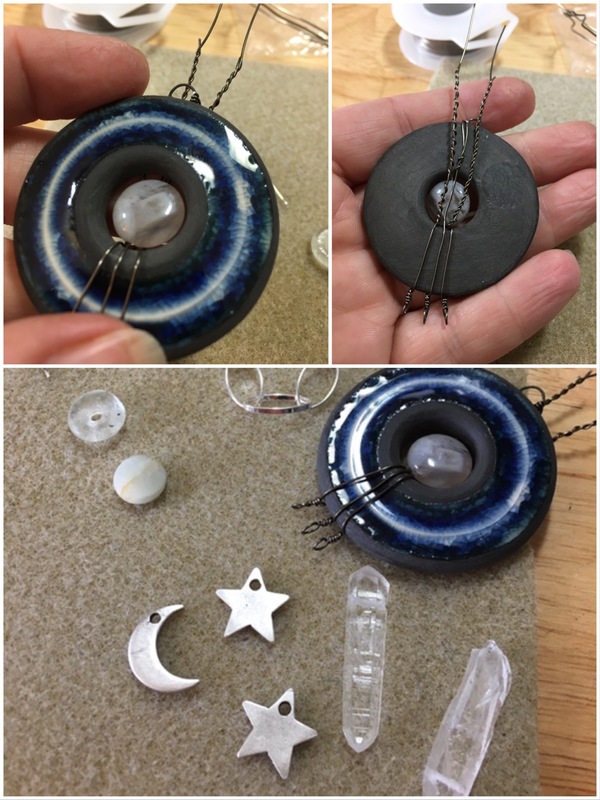 They also had pendants – I have a stunning knot work pendant I think I may bead for myself! Last – but not least is Mission Guild tiles. Their stunning tiles are exemplary of the Arts and Crafts style. Paired with hand crafted wooden frames they are truly gorgeous. Their work references many mottos and motifs from the Arts and Crafts era in the us. 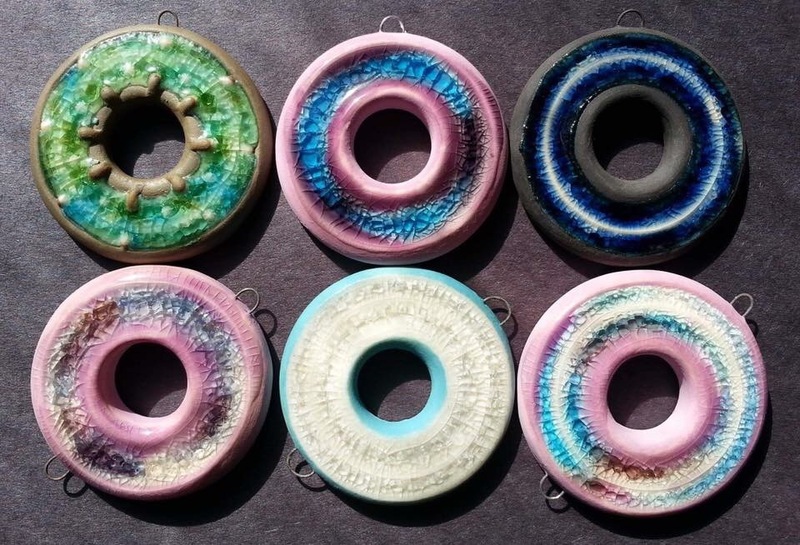 Their tiles are earthenware – fired to ^04 – and there are some great glaze effects! 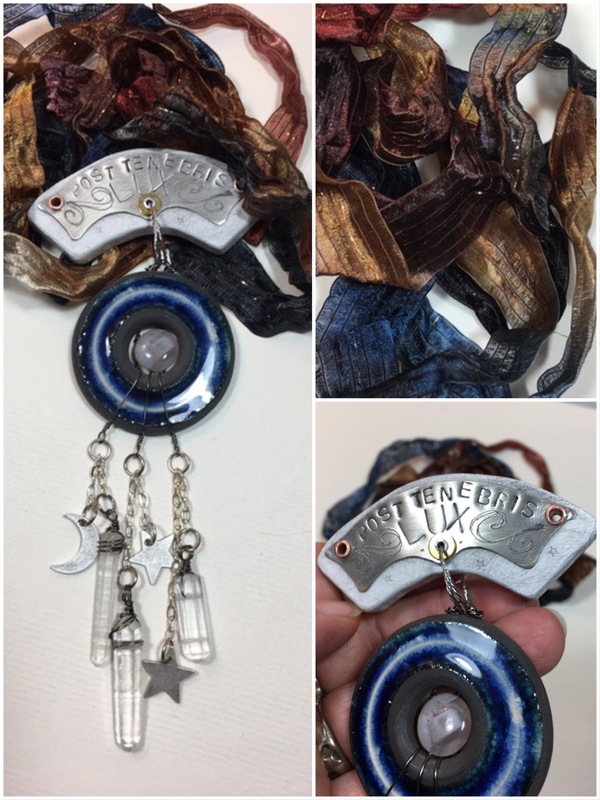 Mission Guild also works in Metal clay. Its lovely to see these two side by side! 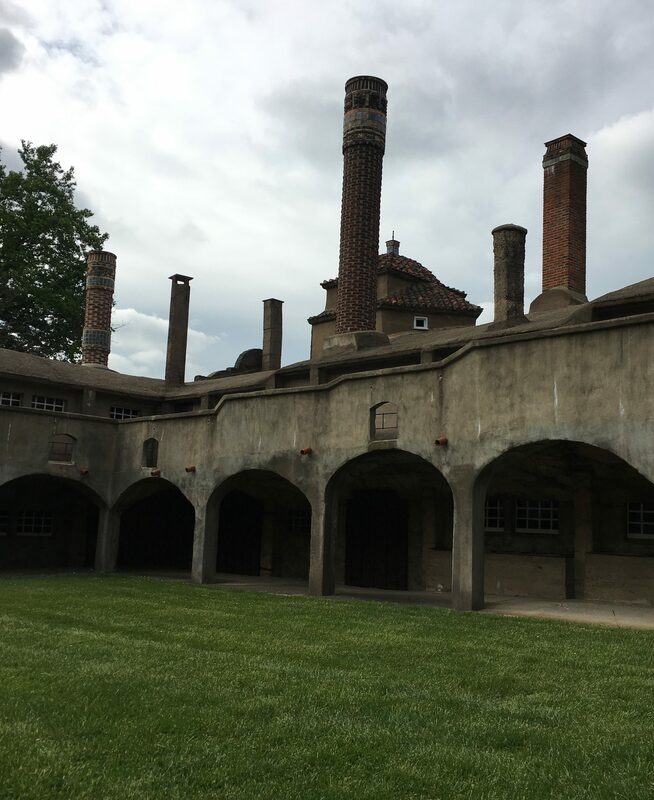 The Moravian Pottery – and Tile Festival! Snapped as I was unloading. Great place to spend the weekend! The Tile works is a unique building – cast in place, in concrete, and studded from top to bottom with mosaics and inset tiles. Henry Chapman Mercer worked with this style of construction for not only the Tile Works, but also his “home” ( mansion? castle?) named Fonthill. 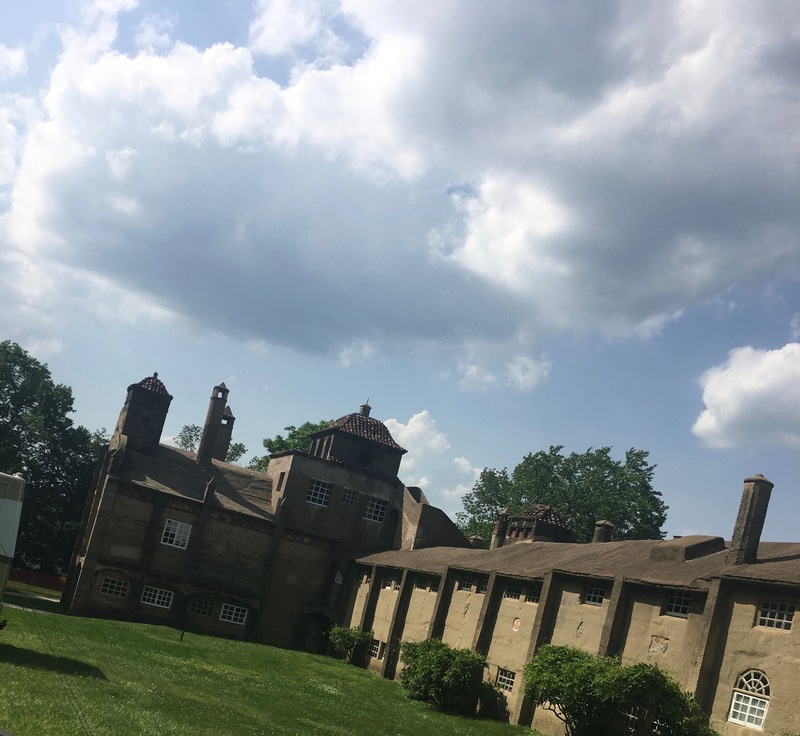 Both are located in parkland owned and maintained by Bucks Co. PA.
Henry Chapman Mercer was from this area, and after school ( Harvard and U Penn Law) and extensive travel in Europe – he settled down in the area. He served as the Curator of American and Prehistoric Archaeology for University of Pennsylvania in the early 1890s. 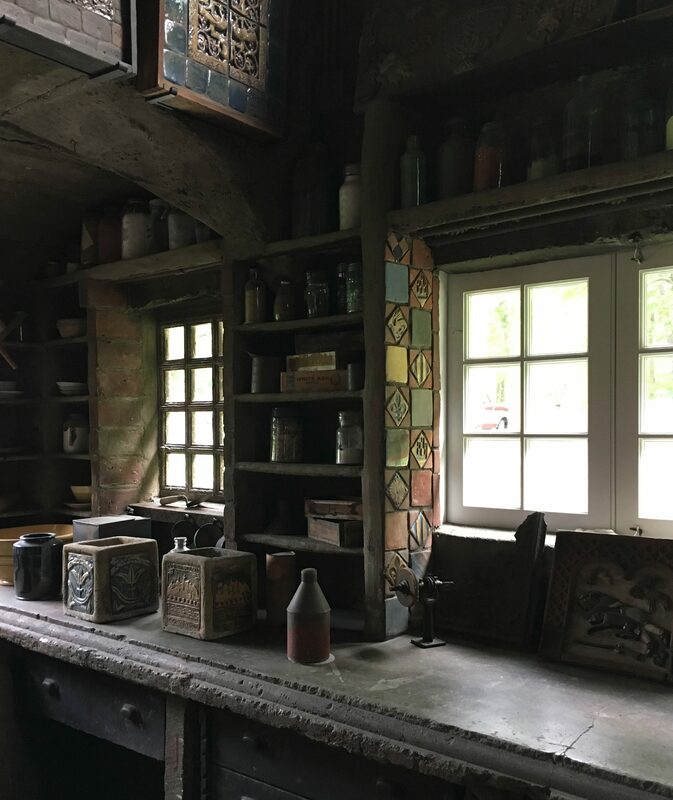 This lead to his love of and research in American artifacts, and later pottery; he apprenticed with a local German American potter. He was heavily influenced by the American Arts and Crafts Movement – and founded the MPTW in 1898. Courtyard, with chimneys. And yes, the chimneys have mosaic bands of decoration! The gift shop, tucked into a Medieval style barrel vault. The tiles made at the MPTW are diverse – and range from impressed terra cotta pavers to sculptural tiles designed for mosaic use. There are flora and fauna, ships, ancient cities, Colonial era occupations… and many Classical and literary references. They tile employ both glazes and colored slips – playing with the contrast of matte and glossy. 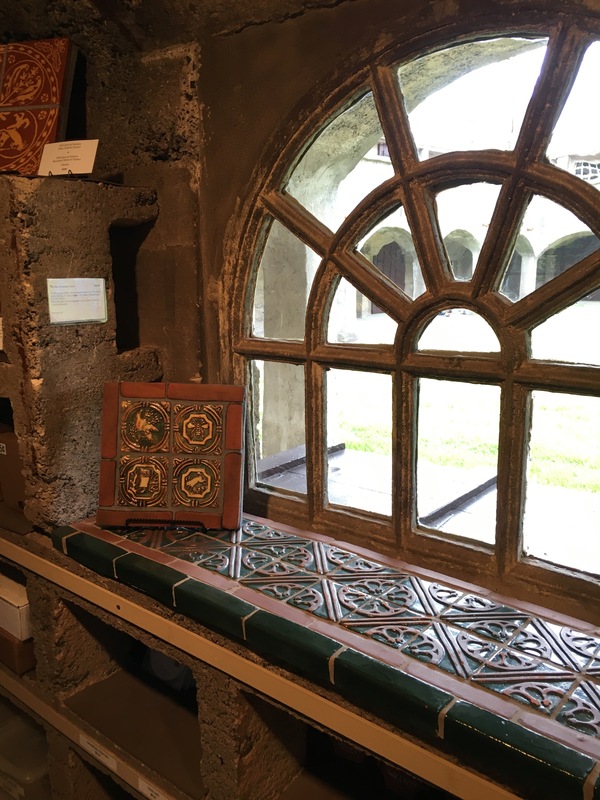 Inspirations run the gamut from Medieval and Byzantine eras, the Celtic Revival, and the Arts and Crafts Movement. Original designs still in production! There are literally tiles everywhere, every surface. 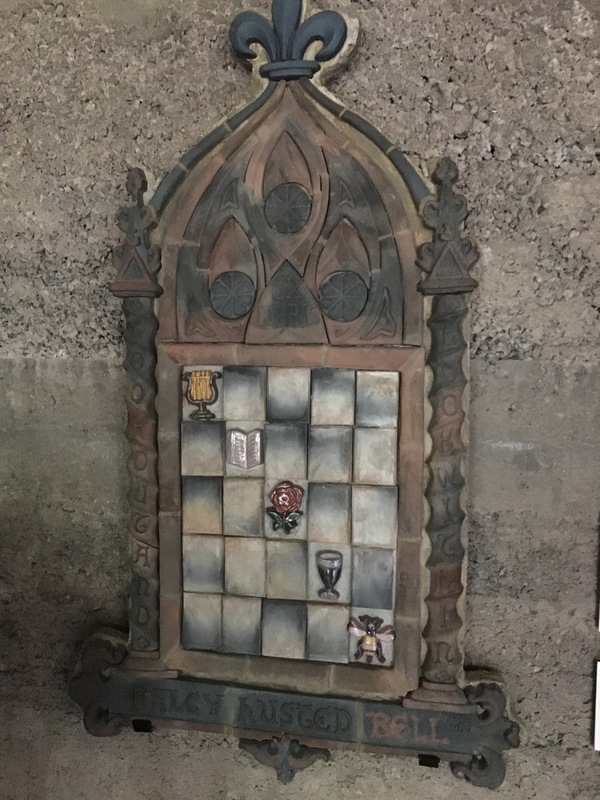 Shown here: “The Quarrel”, castle, triton, and a vignette from “The New World” fireplace. 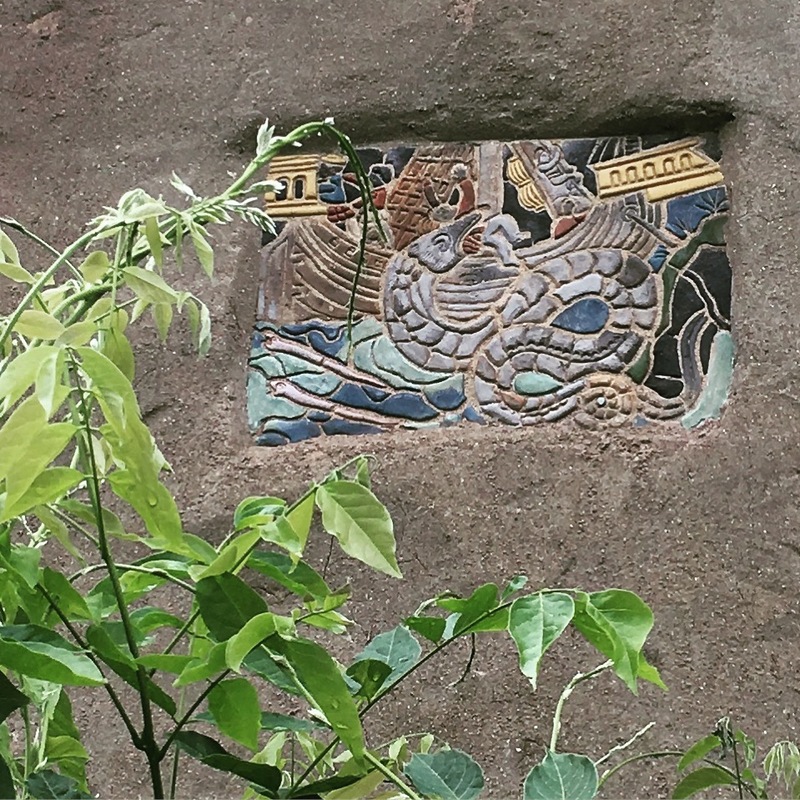 “Bookplate” Mosaic panel – designed by Mercer for his friend Dr. R. Bell. Based on an actual book plate. The clays used were originally locally sourced, and today the MPTW uses similar. comparable clay bodies. As seen in the picture above – at times color is NOT applied – but the tiles are “cindered”. The term is what I would call a sagger firing: tiles are placed inside a ceramic container, with sawdust. They are them fired in the kiln – created a reduction atmosphere in the saggar/container. This results in the clay absorbing carbon from the combustible sawdust – which darkens the clay body itself. 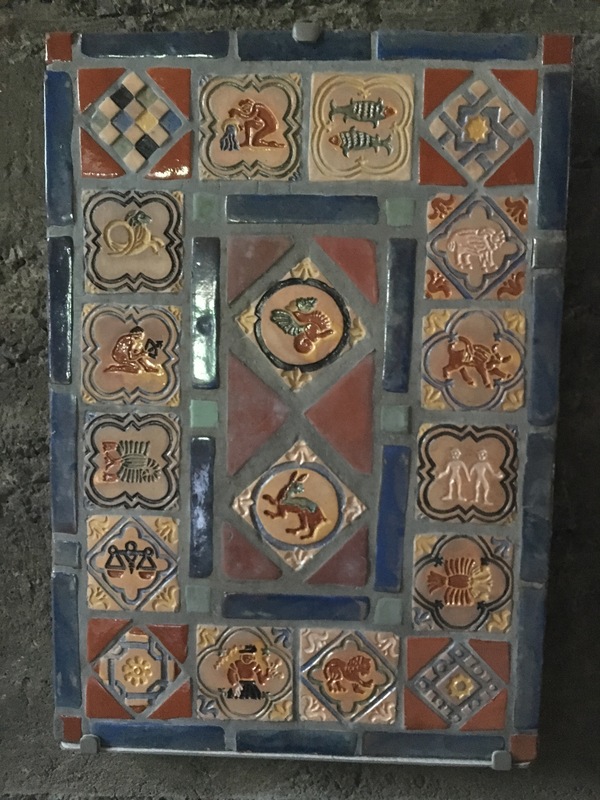 ( Ceramicists: simple definition for the lay people, forgive me) The mosaic catalog on the MPTW website showcases the New World series and has many examples of these “cindered” tiles used in mosaics. The New World Series? It ranges from Vikings,Atlantis, and Aztecs, to Raleigh and Powhatan! I find this place to be infinitely inspiring. It makes me love terra cotta all over again. And I will admit to ideas and plans for some smallish mosaics of my own. There are classes and apprenticeships available. An tours, of course. So if you are in the area – please take a look. It’s truly living history. As to the show? The tile festival itself? More on that – Stay tuned. 2 sessions. 10 days each. 1.5 hours a day in class. 2 classes a day. ages 6-9 – sculpting and hand building/ sculptural and functional work. ages 10-17 – same as above with wheel throwing in the mix and taking priority. Center the clay, open the clay, raise or pull the clay… repeat. Get dirty. Enjoy! Wheel thrown pieces by the teen age group. Dipped in the high fire ^10 glazes! Awaiting kiln loading! Dry. Fire. Glaze. Dip. The hardest challenge of clay camp is drying. The humid weather forces me to break a few rules, and dry pots fast, on a hot kiln. Generallly this is a no-no. But the first week we are sculpting and throwing – I have to get things fired so we can glaze them! New work from this week in Session 2. The book project tiles – expanded a bit to include the favorites Dr. Who and Star Trek. A coffee monster pinch pot. (How did you know it was me? ) And 2 sleeping creatures – an elephant tucked in with radio at his head, and my sample – a bunny reading a book, that I hope to finish tomorrow! 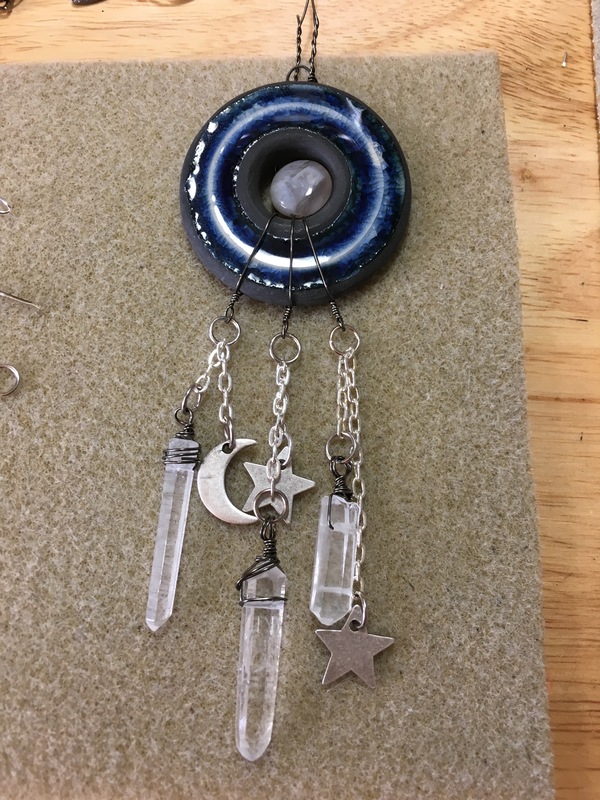 So – in a week or so I will be fully immersed in bead and pendant making – getting ready for Beadfest in Philadelphia. But for know I am playing with clay, loading kilns and just having a good time. See you soon!